Sweden with its capital Stockholm is located in Europe (Northern Europe, bordering the Baltic Sea). It covers some 450,296 square kilometers (almost three times the size of Georgia) with a population of 9,960,490. Swedish, Northern Sami and Finnish are some of the languages spoken by the majority in Sweden (consider regional differences). Did you know that is sharing borders with Finland and Norway. Sweden is the largest of the Nordic countries in Northern Europe, with a population of about 9.3 million. Sweden has a strong tradition of being an open, yet discreet country. Citizens sometimes appear to be quite reserved at first, but once they get to know who they are dealing with, they'll be as warm and friendly as you'd wish. Sweden is great for outdoor life - skiing, skating, hiking, canoeing, cycling and berry-picking depending of season. Stockholm and Gothenburg have great nightlife and shopping opportunities. Most cities have well-preserved preindustrial architecture. Sceneries of nature, less populated than most of Europe. Ice and snow during winter. The terrain is mostly flat or gently rolling lowlands having mountains in west. The average density of population is about 22 per km². The climate in Sweden can be described as temperate in south with cold, cloudy winters and cool, partly cloudy summers with subarctic in north. Possible natural disasters include ice floes in the surrounding waters, especially in the Gulf of Bothnia, can interfere with maritime traffic. To reach someone Sweden dial +46 prior to a number. The local cellular networks are operated on 900 MHz, 1800 MHz, 3G, 4G. Websites typically end with the top level domain ".se". If you want to bring electric appliances (e.g. battery chaarger), keep in min the local 230 V - 50 Hz (plugs: C, F). The sign for the locally used currency Krona is SEK. 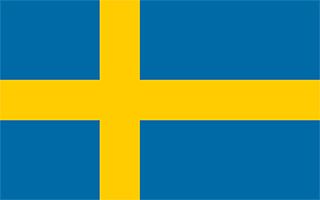 Blue with a golden yellow cross extending to the edges of the flag; the vertical part of the cross is shifted to the hoist side in the style of the Dannebrog (Danish flag); the colors reflect those of the Swedish coat of arms - three gold crowns on a blue field.